Sandaes Turismo, an accredited travel agency specializing in high- quality tourism, has been operating in the Galapagos Islands as well as on the ecuadorian mainland for more than twenty years. 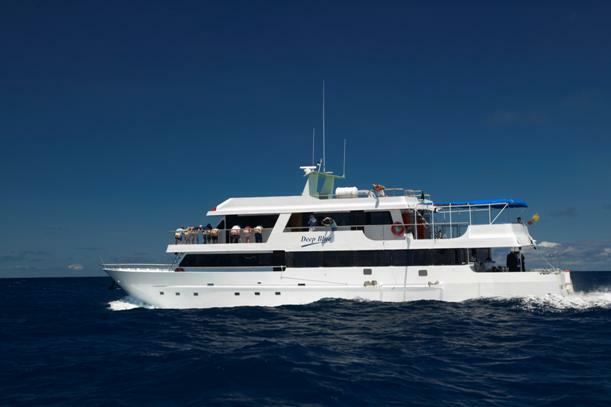 We offer Galapagos diving/land tours at all year long. We represent and own, Deep Blue yacht and also represent hotels in the main land and in Galapagos giving you the largest variety of options in a wide range of prices. We are from and live in the Galapagos Islands so we are very familiar with all aspects of Galapagos Travel. Deep Blue is one of the best first class diving yachts. When you book directly with the owners, you are virtually guaranteed to receive the best service possible. We can custom build any type of trip for you including a Honeymoon, Birthday or Anniversary you'll never forget. We are a family owned and operated company, we do everything ourselves. By choosing to travel with us, you directly help the economy of the Galapagos Islands, as we only employ our crew, that are from the Galapagos Islands, that include the Marine Reserve diving guides credited from the Galapagos National Park. We help the local fishermen, as every week the local fishermen of the islands, go fishing to get us fresh fish for the duration of your 8 day cruise, guaranteed freshness. Our meat is organic, we own a farm, where we raise our chicken, no chemicals, where we get our meat and pork, making sure our clients get the best quality and freshness. All our fruits and vegetables come weekly from our farm in the highlands, picked on the day your cruise begins.